Another writer joins the Anime’s Future series to provide a different angle on interesting up-and-coming artists in the anime industry. Those who know me from the coverage of series like Mob Psycho 100 and My Hero Academia won’t be surprised to hear that I’ve chosen to talk about a pure animator linked to Studio BONES. Thanks to the prominence of social media, nowadays it’s quite feasible to achieve notoriety while still a newcomer. And as much as those artists deserve to be talked about as well, I’d like to use this column to highlight promising creators who don’t have much of a following yet. Let’s skip more formal introduction as everything important had been said before and take a look on my first pick! You might be wondering if I’m not contradicting myself by talking about a young creator who is shining in possibly the most popular ongoing seasonal anime, right after pointing out that I’d like to focus on underappreciated talent. Sadly I don’t think that’s the case, because despite Takashi Mitani’s brilliant contributions to My Hero Academia‘s second season, his name is rarely brought up even amongst people who value individual artists. I believe there’s some bad luck at play here, since he’s consistently been entrusted with episodes surrounding the climactic clashes, but never the true highlights. It’s hard to stand out as an up-and-coming artist when your work is so close to industry behemoths like Yoshihiko Umakoshi and Yutaka Nakamura! Before tackling Mitani’s work on HeroAca though, let’s begin by looking at the start of his career. Takashi Mitani entered the anime industry around 6 years ago as an in-between animator. Not much is known about his works during this period because young in-between animators from outsourcing companies generally aren’t even listed in the credits by their name, instead being vaguely included as part of the studio itself. It was in 2013 when he started to appear in the credits as 2nd key animator and later key animator employed by Osaka-based subcontractor studio Wanpack. He stayed there until late 2014, working on notable projects such as Attack on Titan and Kyousougiga (both 2013), but also the infamous Sailor Moon Crystal episode 2 (2014). After cultivating his skills and leaving Wanpack, he started to work freelance and quickly landed jobs on projects involving industry stars like Blood Blockade Battlefront and Plastic Memories. The former turned out to be very important for his career, as BONES Sub-studio C recognized his skills and hired him to work on their next project: Concrete Revolutio, where he was quickly promoted to animation director; he had his debut on episode 4, supervising both mechanical and effects animation. While remaining freelance, he has worked exclusively for BONES ever since. And so we arrive to his current job as regular animation director and key animator on the second season of My Hero Academia. Takashi Mitani’s key animation from Mob Psycho 100 #9. Up until now, in this series we’ve covered the careers of exceptional creators who seemed fated for greatness ever since their first steps – the most precocious animator and director of all time, someone who graduated from the most prestigious animation course, and an artist who enamored fans all around the world while still in training is quite the way to kick off. We don’t want to give off the impression that only a group of chosen ones can achieve greatness, though. Mitani’s career hasn’t been a case of bypassing the system and regular progression through unbelievable talent, but rather a more standard tale of hard work and perseverance. As a fan of action and effects animation in particular, he’s been nurturing his skills in those fields the most. It doesn’t feel like a coincidence that he’s ended up building a solid relationship with a studio that prominently features those elements more often than not. His animation takes cues from Yutaka Nakamura’s style of drawing effects but – as the most interesting animators influenced by him do – he’s adding his own flair to it rather than strictly mimicking. Another point of interest that makes him stand out is how he won’t shy away from background animation in his scenes, despite TV anime’s constraints. Mitani’s output on Concrete Revolutio mostly flew under radar…as did the show itself, to be fair. That was probably both due to its low popularity and Mitani’s work not quite having achieved its current level of polish. If you compare his animation from ConRevo with his most recent works, you will see how much he has improved in less than two years. The turning point here, at least when it comes to the reception of his work, was likely his work on Mob Psycho 100‘s ninth episode. His recent output in My Hero Academia S2 serves as a great showcase of the skills he’s developed as both key animator and animation director. His first appearance on the series, Iiida’s Recipro Burst followed by Deku launching an attack on Todoroki, immediately tells you what his style is all about: notoriously sharp drawings with effects more on the angular side, an economic approach that nonetheless packs a bunch, and sudden bursts of dynamism through techniques like background animation and impact frames. Four episodes later he supervised Ochaco’s fight against Bakugo, which intentionally exploited his specialization for a conflict mainly focused on explosions and smoke. This assignment confirmed the production side clearly recognizes his forte and is willing to let him do what he loves. And since the final fight of the tournament was held between two students who are essentially effects machines, why not let him supervise it too? 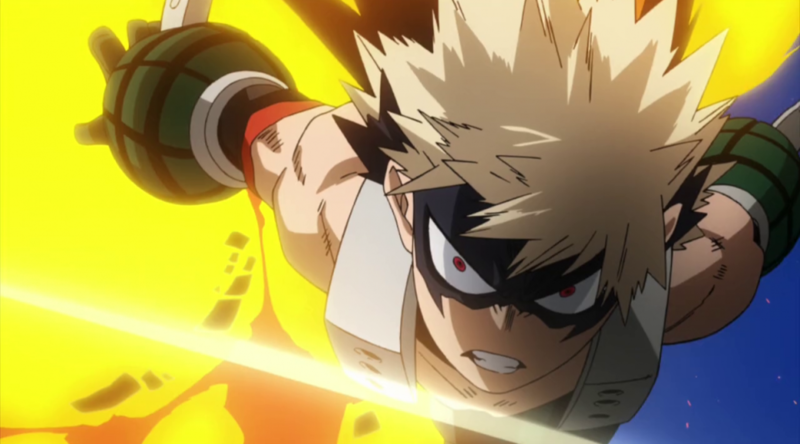 Although Bakugo’s finisher was partly animated by Hironori Tanaka, Mitani’s effects animation on Todoroki’s hand was very reminiscent of his work in episode 5, while the final explosion was a friendly nod to Nakamura. His latest appearance to date was on episode 16 where he once again supervised the effects-heavy first half of the episode. Since those were deemed less important scenes his output was more reserved, but even in this economy mode of sorts the result was noteworthy. If anything, I consider this one of Mitani’s greatest assets; his animation catches the eye even through short loops, to the point that it’s sometimes hard to parse just how few drawings he needs to craft an impressive scene. His work packs timeless charisma in the same way the set of animations in a good fighting game do – even when it’s not actively wowing you, it’s always pleasant to watch and never gets old. His progression might continue to the point he’ll become the kind of sakuga star that drives people to projects…or maybe he’ll stay in this more comfortable zone, as an immensely reliable supporting figure. Don’t take this as a negative though, since this is perhaps what anime needs most: people capable of sustaining projects even with few resources, consistent artists who turn limitation into an art. And this takes me to an important final point; in its current state, the animation industry is simply short on effects animation specialists. While it’s an aspect that anime as a whole has always focused on, and its nature means that it’s technically impossible to draw FX wrong, you still need masters in this field if your project regularly requires spectacular 2D effects. Takashi Hashimoto keeps doing ludicrous amounts of work supervising effects animation on multiple shows per season, while also simultaneously working on movie productions and occasionally providing guest contributions to other TV shows. Meanwhile, another effects specialist like Kazunori Ozawa might very well be the most active key animator working in the industry now – in the summer season alone he’s already participated in 12 different series, and they’re all noteworthy moments! On the other hand, experts like Hideki Kakita are busy on theatrical projects ala Eureka Seven Hi-Evolution and don’t seem to be accepting any other animation offers. In other words: the demand for effects animation is huge and the industry doesn’t have capacity to properly handle it. 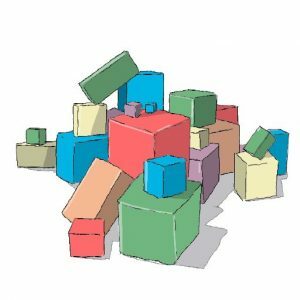 It’s not a problem limited only to effects animators but, much like 2D mechanical work, the situation is particularly troublesome here. And so, since we’re writing a series about Anime’s Future, it feels appropriate for me to bet on someone whom the industry desperately needs! Your last point is a cogent one. While nobody will necessarily react poorly if you have shoddy FX work, it also means that nobody will have a memorable impression of the work to begin with. Thus, the importance of FX animators is an understated one. This article also reminded me of Shoichi Masuo, another great FX animator (Gunbuster, Rebuild of Eva), who recently passed away. Glad to learn of a new face who is taking up the FX challenge. Hey, thanks for the write up it was interesting to read about this particular animator and his noticeable style. I have a question. On the term, impact frames, could you give me an explicit example? It would be wrong to flaunt this term without understanding it. From what was written, it is usually brief shots of black/white (monochrome) or one color (chromatic) for an emphasis on the animation? In the Booru, there were scenes from Made in the Abyss, and Kobayashi while Abyss and Kobayashi were easy to identify their brief flashes which must be impact framed? Now, with the elongated usages, would an example be Mob’s Transformation (Mob Psycho 100)?